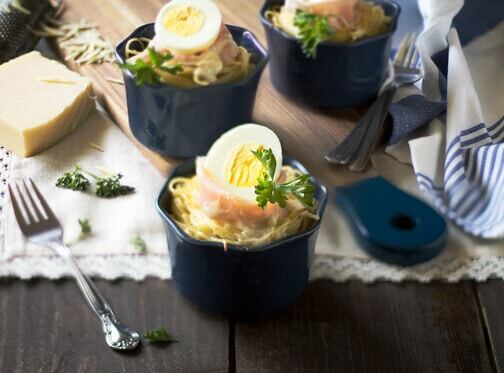 These cheesy spaghetti nests are served straight out of ramekins. I love when there are no additional dishes to be cleaned. 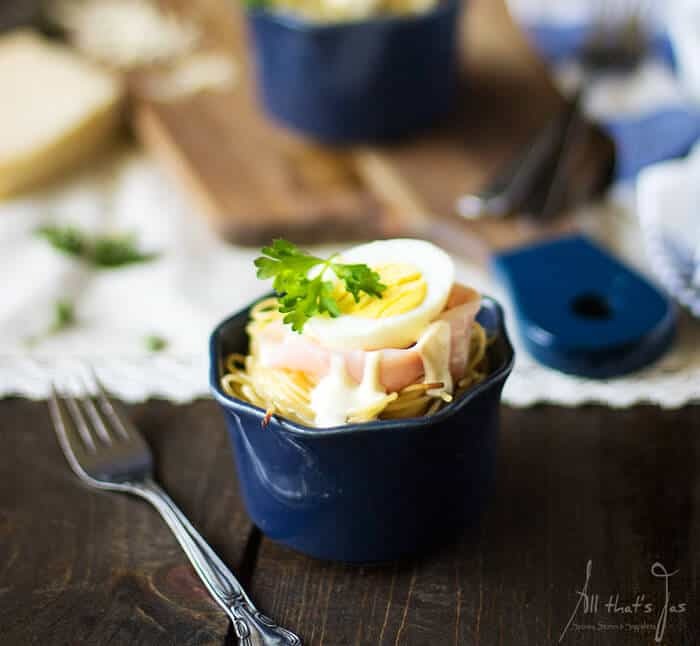 I’ll take a bowl of spaghetti over tiny bites any day, but these are ideal for an appetizer, finger food party or a light supper. I think I’d want them for breakfast too. Why not? 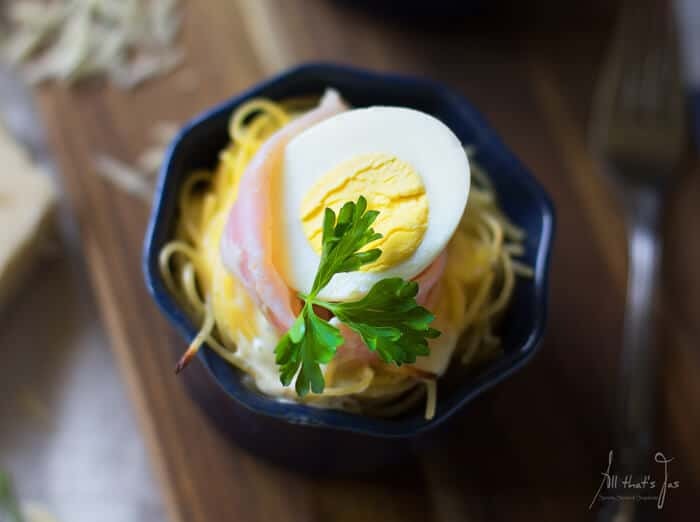 Simple ingredients are used for the spaghetti nests but they don’t lack the taste or the elegance. Creamy, cheesy goodness paired with ham and eggs. Need I say more? If you can’t find crème fraîche at your stores, substitute with sour cream, but the result will be slightly tangier. To make your own: combine 1 cup heavy cream with 3 tablespoons of buttermilk or ½ cup of sour cream; cover the container and let it sit overnight at room temperature. Add freshly ground black pepper, dried basil, chives, parsley or any herbs you prefer (such as herbs de Provence or Italian), and lemon zest. Cook spaghetti in salted water according to the package directions; drain. In a mixing bowl, toss hot spaghetti with 4 oz. crème fraîche and cheese. Preheat oven to 350 degrees F. Lightly butter ramekins and place them on a baking sheet. Wrap about 1/6 of the spaghetti on a fork and place into each ramekin. Bake the nests for 10-15 minutes. In a small bowl, mix together crème fraîche with mustard and Worcestershire; season with salt and pepper. Put a dollop of sauce over nests then arrange folded ham slices. 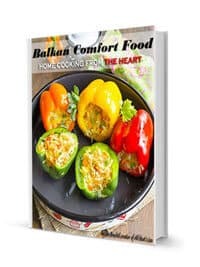 Spread 1 tablespoon of the sauce over ham. Top each with egg halves. Garnish with parsley. 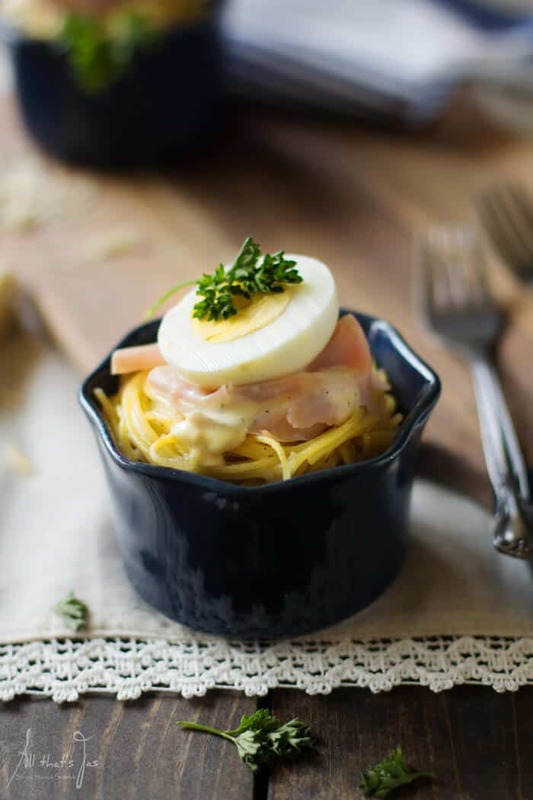 Serve these cheesy spaghetti nests at your next gathering and you’ll get rave reviews. It takes minimum effort to make them yet they leave an unforgettable impression. 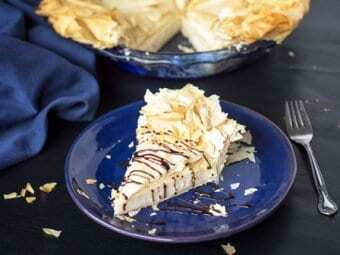 * If you can't find crème fraîche at your stores, substitute with sour cream, but the result will be slightly tangier. To make your own: combine 1 cup heavy cream with 3 tablespoons of buttermilk or ½ cup of sour cream; cover the container and let it sit overnight at room temperature. Add freshly ground black pepper, dried basil, chives, parsley or any herbs you prefer (such as herbs de Provence), and lemon zest. 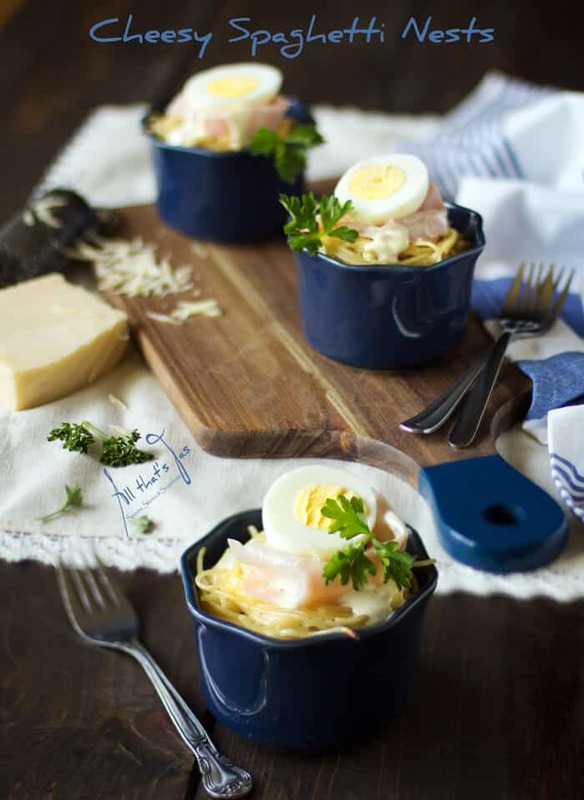 Your cheesy Spaghetti nests are adorable. I can picture these being so fun to serve at a little brunch gathering. I would have to make at least 6 of these servings for each teenager or maybe increase the size of my bowls. LOL Wishing you a super weekend! Sharing! Lol, that’s why they are an appetizer, otherwise serve right out of the pot 😀 Hope your weekend was lovely! THAT is an awesome idea for a party Jas! The only thing is, how many of those do u hv to make? I bet they go pretty quickly too! Oh! And what herb is good to use with crème fraîche? P.S. Been busy lately and haven’t checked your (or anybody else) blog for updates. Hope all is well. Sending you hugs across the miles and Oceans. These I am definitely going to try. Love all the ingredients. Thanks for sharing. My kids would love a meal served in little cups like these. Maybe they’d eat more! Thanks for linking up with Funtastic Friday. I was a picky eater when I was little too. Mom’s trick to get me eat was to present food in an unusual way. Thanks for stopping in, Victoria and have a great week! These look elegant and delicious. Yet, they also remind me of little bits of comfort food. Thanks, Crystal. Nothing better than simple, comfort food. A “fancy” presentation is just an added bonus 😀 Thanks for visiting! Looks adorable and sounds delicious! I will have to try this my favorite gluten free pasta. Thank you, Kelly! 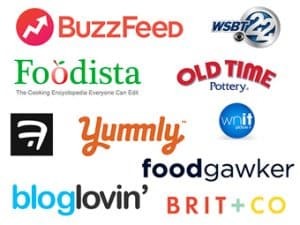 Which gluten free pasta brand do you use? I can’t seem to find a good one, they all taste like wallpaper glue, lol. Yum! Your post is making me so hungry. 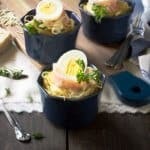 This recipe looks great, and your pictures are beautiful! Oh my goodness, I think I may be in love! They look so good and sound even better. I can’t wait to give them a try! Thanks for sharing at Throwback Thursday! How fun are these! I love the portion control!! Thanks for sharing with us at Throwback Thursday!! acalling here. You should definitely become a food photographer. I ti s such a yummy and simple dish and yet thru your lens it looks amazing. Mary, thank you so much! I’d really like to do food photography and even wrote proposal letters for local restaurants but then chickened out. First, I never trust I’m good enough and second, I have no clue what to charge them, lol. Have a great weekend, my friend!